[dropcap]I[/dropcap] thought it was time I got my observations down about the differences between British and Canadian supermarkets before I become so used to things as they are now that I no longer remember what first jumped out at me. I recall my first visit to a Canadian grocery store. K & I went to do some food shopping during the week we spent here together looking for somewhere to live back in July 2010. It was night-time when we left the hotel and we drove to what is now my nearest local grocery store, Metro. My first impressions were good, it was like Waitrose back home in its style and feel – smaller than the leading giants Tesco and Sainsbury’s, but tailored to a more exacting customer. Of course, as anywhere, this was reflected in the price. But we still shop there regularly, the quality of the fresh produce is high and when they have deals, they can be VERY good deals with significant savings. That night we spent some time browsing all the unfamiliar brands and packaging before making a few purchases and heading back to the hotel. Contrast that to my first visit to Wal-Mart on my last evening in the country before flying home. As soon as I got in the door I HATED it. The aisles were narrow and you couldn’t concentrate on shopping without being distracted about blocking someone else’s path. The trolley’s (called shopping carts here) were not the four-wheel-drive luxury I had taken for granted back home! They were narrower (to fit in the aisles) and the back wheels were fixed, adding to my mounting frustration as I tried to manoeuvre out of people’s way! The store itself was like a huge warehouse, soulless and depressing, even down to the grey plastic carrier bags which split almost immediately, resulting in much double-bagging. I could feel the disapproval of the ice-caps and species-nearing-extinction as I packed. Apart from the ubiquitous dry-cleaners, there was a McDonalds (no surprise), a hairdressers, a travel agents, photo-shop and various other little outlets I had no inclination to explore. I exited the store almost suicidal! Was it too late to stay in England? Funny the things that influence your decision-making… Perhaps it was my emotional state at the prospect of leaving Canada and my husband the following day coupled with culture shock (my eyes welled with tears in the pasta aisle, much to K’s bewilderment!) but I found Wal-Mart a DISMAL place. I was much happier when, a couple of months later, my next-door neighbour took me to Real Canadian Superstore (yes…that IS what it’s called – I’m not having you on, I swear…) This was more like it! It was bright and welcoming (I can only say Wal-Mart must be lit by those long-life light-bulbs with their nasty, cold, semi-brightness – like a white cloth that’s been through the wash too many times and is no longer white but a greyer, indeterminate shade). 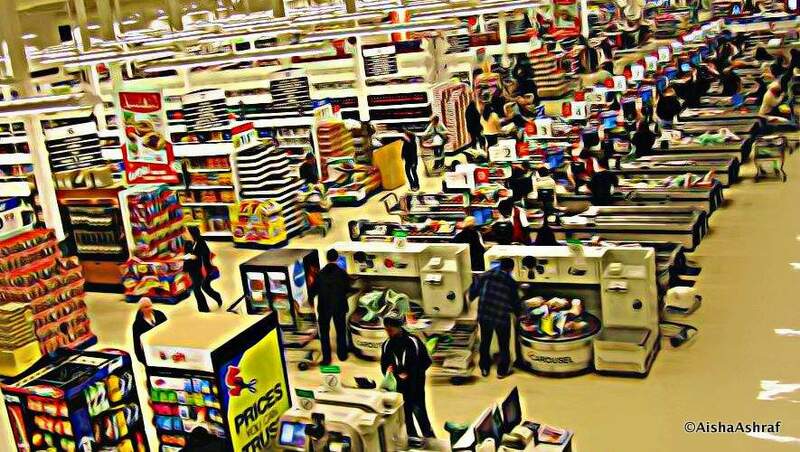 The signs with their blue, red and yellow colour scheme were reminiscent of Tesco, and the wide aisles were more in keeping with what I was used to. Their clothing range, Joe Fresh, has recently launched its own stand-alone stores across Canada and the place didn’t have that “bottom-of-the-barrel” feel to it. Oh, and before I forget, I don’t know who is responsible for the choice of music they play in-store, but anywhere with Foo Fighters on the airwaves can’t be bad! The differences I noticed between UK and Canadian supermarkets fall into two groups. The first is the language difference. Many of them are covered in an earlier post on this blog called English/Canuck Dictionary, things like Coriander/Cilantro, Porridge/Oatmeal and Crisps/Chips. 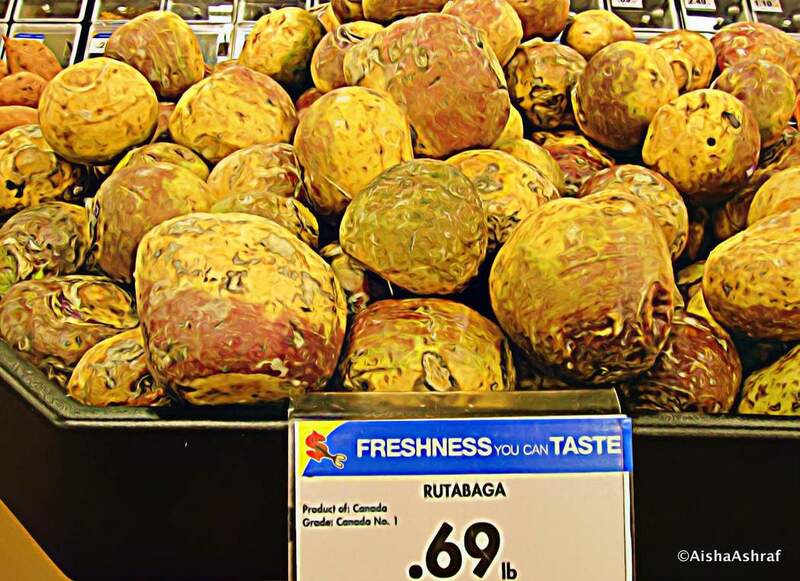 But I discovered a new one just recently: what is known in Britain as Swede is called Rutabaga here… go figure! K reckons it sounds more like a country than a vegetable! The second difference is about which products are the most popular here, Canadian best-sellers, if you will. I would love it if any Canadians with experience of British supermarkets could let me know what they noticed was popular in Britain. I can only comment on what I noticed here, it being unfamiliar to me and therefore notable. Canadians LOVE juice. Whether it’s fruit juice or fruit flavoured, they have whole aisles dedicated to the stuff. There is non-concentrate, with/without pulp, lower acid, vitamin-enriched and any fruit or vegetable it’s possible to extract juice from! And here’s a thought! Why not mash some clams into that….a la Clamato! Another thing that is very popular is frozen juice. You buy it in cardboard tubes with metal discs at either end, defrost and dilute with water to create fruit juice or punch. Canadians LOVE salad dressing, again, there’s shelf upon shelf of it – all different flavours. Unfortunately, most of them are made by Kraft who seem to be responsible for feeding Canada. In Britain, the Kraft label was associated with cheese slices – here, they make EVERYTHING, including the unofficial national dish, Kraft Dinners! To appear truly Canadian you must exhibit an unholy love of either Caesar or Ranch dressing – none of that Mediterranean, oil-based malarkey, you want something creamy and fattening to balance out all that healthy salad you have with your wings, ribs or T-bone! Soft drinks – and all their categories! Energy drinks are very popular here: Gatorade, Monster Energy, Rockstar, there are loads of different brands…. So are iced teas: Arizona, Liptons, Nestea, Snapple…. and don’t forget your mixers: Canada Dry (my favourite) and club soda. We have Kool-Aid, Root beer (tried it – wasn’t a hit at our house – got too much of a mouthwashy taste, a bit like watered down Dandelion & Burdock), but sadly for K, no Irn Bru! So, that’s pretty much it – the only other thing that springs to mind is the difference in loyalty cards. In the UK you can accrue points as you shop which convert into money off your shopping, whereas here, you can collect airmiles or get a store credit card. I don’t remember milk in bags but I do remember Clamato (my uncle is a big fan and used to force the stuff down my poor English throat). Out east, you guys have Loblaws, where as we had Safeway in the west (always funny, given we had/have Safeway in England). My favourite ‘Westie’ store has to be Save-On Foods though. Clean, airy… and lots of other positive words that come to mind. Did you find it different/strange being able to buy herbs (pronounced with a heavy ‘h’) from the bag, almost like with pick n’ mix? Hi Russell, how’s life in Oz? Was your wife pleased to find cupboards full of ranch dressing and not much else when she arrived? I can’t believe what you said about your Uncle and Clamato! I’m sure you could sue….. just out of interest, and because I lack the courage in this instance, did it taste as bad as one imagines? Not sure what you meant about the Erbs, they sell them in bunches now. I haven’t been anywhere where you can measure out how much you want. But they are fond of the wire twists and elastic bands for holding stuff together. I always take them off as soon as I get home, as they are usually so tight they bruise the produce. These are great observations, though I’m from the US. I was in the UK a few summers ago and remember the names of the supermarkets. I remember loving Waitrose, but couldn’t understand why until you posted about the personal effect of it. The other two did feel more like said Wal-Mart…like I had to hurry and make decisions and it was NOT okay to just stand and gaze at all the marvels. At Waitrose, I could. I enjoyed looking at the different “crisps”, cheeses, and other non-Asian things. We are in Asia, so being able to read labels was such a blasts! I’m posting this to my Canadian friends because I think they will get a laugh at this, especially the ones that just moved back this past summer. Hi MaDonna, firstly, I wanted to congratulate you on your great blog, I’m now following as I know you will cover stuff that’s relevant to my family. Secondly, thanks for the tweet and passing this post on. Well done on “proper” use of the word “crisps” too, good to see I am providing people with an English education!!! It never occurred to me how reading packaging you can understand must be like a thirsty man finally reaching an oasis in the desert – you must just want to drink it all in with your eyes! Great post! I hate grocery shopping and try to get in and out as soon as possible but I have to say I do like it better here than in Canada. I like having smaller stores. Grocery stores here really cater to the single person and the person on the go. Most have a section with sandwiches and other foods to make up a meal deal for someone to grab some lunch quick. Also when I lived alone and shopped for myself I found it easier to get smaller portions and thus waste less food. Some of the popular items here – Crisps, there are flavours here I have never heard of nor would have thought would be put into crisp form. Tea, typical but true, there is so much on offer. Also biscuits, again a bit typical like the tea but it seems like they are the standard thing to make sure are stocked at work so they can be offered out if someone comes around. The numbered list looks a lot like US stores as well. All except the milk in bags, ours are in cartons, plastic or returnable bottle. It is also very expensive which is sad because the $ does not go to the farmers. Oh that is a definite rant for another time LOL. Anything dairy is expensive here Cat, which is a complete mystery to me. Are cows an endangered species in Canada? Hello there, I love your blog, I’m a canuck living in the U.K. and was looking for blogs for my husband to read (he’s british) as we prepare for living in Canada. He knows the basics since we have had many trips to visit my family, but thought it would be nice for him to have a british perspective. Anyway the one thing I will comment on about this post is that the milk in the bags must be a more eastern type thing, although you can get milk in bags in the west it is far more normal for people to have cartons or plastic jugs just like the U.K.
Hello Tasha, thanks for your kind words and taking the time to comment. Great idea, by the way, preparing a Brit for the move with some expat blogs… let me know if there’s anything he’d like me to write about in particular 🙂 I’m guessing you’ll be coming out Vancouver way in the future. When do you move? I read your experience about the Real Canadian Superstore with great fanfare! I used to work at one here in Saskatoon. 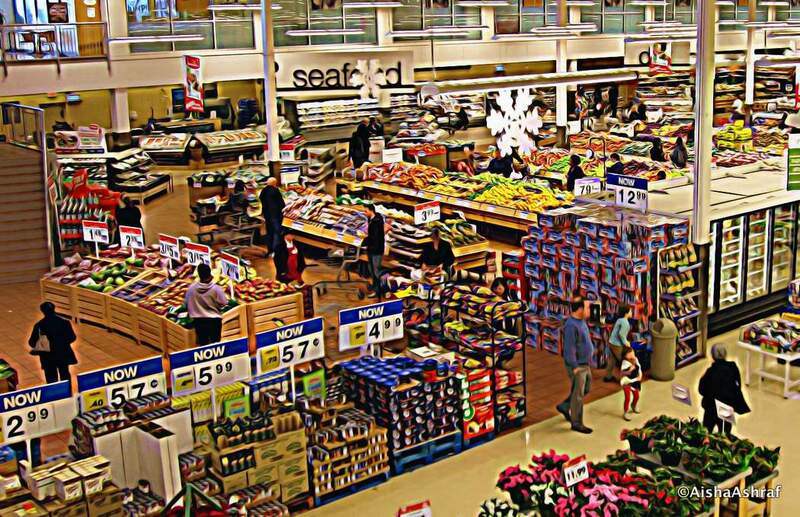 Did you know that the stores used to sport a different colour before Loblaw started to renovate all stores in 2009? Instead of red, white and blue, they used to sport green, yellow and red outside. Inside, the ceiling would be white with mostly beige or white walls and small green signs. The very last one is what the signage within the store used to be like.